Show your support for the indie comics scene. Show your support for Comicsy. Comicsy is not-for-profit website, a fact we’re somewhat proud of. Profits are hard to come by in the world of small press publishing and we want to see the proceeds from sales go directly to comic creators rather than some corporate fat-cat’s back pocket. However, we still have to pay the bills! Hosting and development fees can be quite costly, especially with all the digital downloads we support via the site. You can help support Comicsy, by clicking on the donate button on the right. All monies given in support of Comicsy will go directly in to the funding of this site. Comicsy also now has its own Patreon page allowing you to pledge money to the upkeep and upgrading of Comicsy. 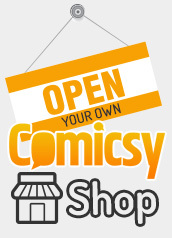 Comicsy was founded in 2012 and has been working tirelessly to provide the British and Irish indie comic scene a unified marketplace for creators to sell there goods. Looking to the future, we’d like to expand Comicsy so our users can take advantage of new online opportunities, connect with each other via a networking site, and receive a better service from Comicsy in helping them to promote their comics, art and graphic novels. Please support Comicsy via Patreon.